A Platinum Annual Pass permits the person named on it to gain entry into the Theme Park during any off peak days. A Platinum Annual Pass can only be purchased on Direct Debit and a £30 per person deposit will be taken, which will come off the total cost of the Annual Pass. Platinum Annual Pass holders will only be permitted into the Park on production of their valid Annual Pass card. Lost or stolen Platinum Annual Passes can only be replaced after a security check for a fee of £3.00 per pass. This fee is non-negotiable. Annual Passes are not interchangeable, refundable or transferable for any reason and lost, forgotten or stolen cards will be replaced at a cost of £3.00. Annual Pass cards must be presented on arrival at the park and swiped through the turnstiles. A Platinum Annual Pass is issued individually to each person and cannot be used by another person. It is not permitted to be used by another person under any circumstance. All children under the age of 12 years must be accompanied by a responsible person aged 16 or over at all times. A Platinum Annual Pass is valid for 12 months, however this will be a rolling Direct Debit contract and you must give us 28 days notice before expiry to cancel. Please note you cannot cancel your annual pass mid contract, once the direct debit is rolled over you will contracted to the next 12 months. We will request any cancellations in writing, this can be done via letter or email. Annual Pass holders are subject to the same rules and regulations which apply to all visitors to the Park. These may be subject to change at any time at the discretion of the Management. Crealy Theme Park & Resort Management reserves the right to refuse any application for an Annual Pass or renewal thereof, or to withdraw any annual pass at any time, without giving any reason. Platinum Annual Passes are not refundable, either in total or in part under any circumstances. The purchase of any Annual Pass cannot be done so in conjunction with any other offer/voucher and cannot be purchased using the online discount. Crealy Theme Park & Resort reserve the right to amend opening times, withdraw attractions, discounts and amend opening times without prior notice. Some attractions are not included in the Annual Pass price, for which a reasonable charge is made. The terms of your Annual Pass also require you to have a ‘recognisable photo’ when scanning your Annual Pass card at the park entrance. Please note all outdoor attractions will be closed during term time. Indoor attractions will remain open on selected dates of the year. Platinum Annual pass holders will also benefit from 20% off all purchases, 2 night Crealy Meadows camping stay, 50% off entry for all family and friends, 50% off camping and glamping breaks, a FREE refillable souvenir drinks Cup, FREE exclusive Platinum Annual Pass Lanyard, entry to selected late night events, one ticket to Crealy Christmas Spectacular & one pit stop pass. (Please note that the Crealy Christmas Spectacular ticket on selected dates only). Your 2 Night Crealy meadows stay is on selected dates only & subject to availability. This will not be valid in the Devon school holidays. 50% off entry for friends is only valid if the Annual Pass holder is present & the pass is valid. 50% off for friends cannot be used in conjunction with any other offer. This discount can only be used when present at the Theme Park & not online. One ticket can be purchased at 50% off per Annual pass and can only be used once within 24 hours. (Please note this is not valid on Crealy Christmas Spectacular tickets). 20% off all purchases is only valid at selected outlets, please check before purchasing. Not to be used in conjunction with any other offer. ​50% off Crealy Meadows discount is subject to availability and only valid on Camping & Glamping breaks at selected times of the year only. *Not to be used in conjunction with any other offer. Your FREE souvenir drinks cup and Lanyard will be subject to availability. The souvenir drinks cup & Lanyards are non-changeable and non-refundable. You will receive one souvenir drinks cup and one lanyard per annual pass purchased. Platinum Annual Pass holders will gain FREE access to selected evening events. Please check before arriving. We reserve the right to change this at any time. Platinum Annual Pass holders will receive one pit stop pass per annual pass. a. The Pit Stop Pass will be valid for as long as your annual pass is valid. b. The Pit Stop Pass can only be used by the annual pass holder & you must have your annual pass present with your pit stop pass. c. The Pit Stop Pass is non-transferable to any other Annual Pass holders. d. The Pit Stop Pass must be shown to the ride operator, along with a valid linked annual pass. e. The Pit Stop Pass is non-refundable & non changeable. f. Lost cards are subject to a £3 replacement cost. g. Go-Karts may be closed subject to rain or other adverse weather conditions. h. All Pit Stop Pass holders must adhere to the regular Crealy Grand Prix rules and regulations as displayed at the entrance to the ride. One Crealy Christmas spectacular ticket will be given per Annual Pass and this needs to be booked in advance. Dates and times are subject to availability and this will be done on a first come first serve basis. Crealy Theme Park & Resort reserve the right to contact you in relation to service information including, but not being limited to, information to these terms and conditions of use, expiry and/or renewal reminders. Crealy Theme Park & Resort reserve the right to use your details to send you relevant marketing information when you sign up for an Annual Pass with us. If you do not wish to receive this you will have the option to unsubscribe. Crealy Theme Park & Resort reserve the right to vary these terms and conditions at any time. We reserve the right to remove any offers and benefits at any time without prior notice. Any ticket purchased through Crealy Theme Park & Resort such as at admission gate, online or through the call centre will be able to upgrade to a Crealy Annual Pass. The cost that will be deducted off the Crealy Annual Pass will be the amount that you purchased your ticket for. As an example, if you purchased a ticket for £21.95, it will be taken off of your Crealy Annual Pass. This is available on full paying Annual Passes and direct debit Annual Passes. If your entry tickets are complimentary tickets, or purchased through a 3rd party you will not be eligible to upgrade. Please note we are only able to upgrade you on the day of your first visit to Crealy Theme Park & Resort and cannot accept upgrades on our 6 day free return tickets. A Gold Annual Pass permits the person named on it to gain entry into the Theme Park during any Theme Park opening day. A Gold Annual Pass can only be purchased on Direct Debit & a £30 per person deposit will be taken, this will come off the total cost of the Annual Pass. Gold Annual Pass holders will only be permitted into the Park on production of their valid Annual Pass card. 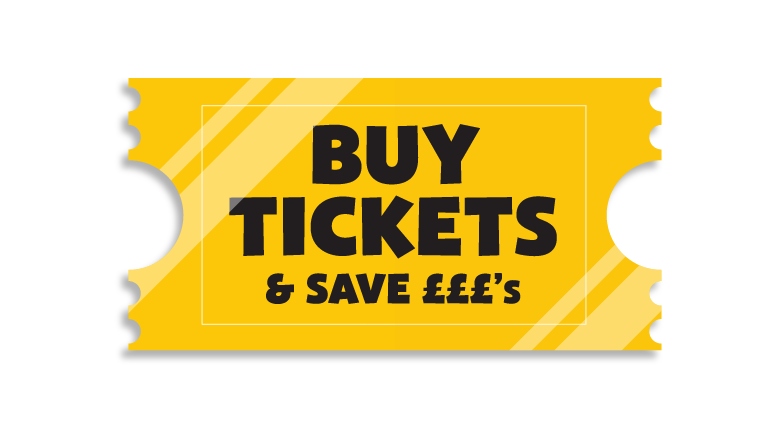 Lost or stolen Gold Annual Passes can only be replaced after a security check for a fee of £3.00 per Annual Pass. This fee is non-negotiable. A Gold Annual Pass is issued individually to each person and cannot be used by another person. It is not permitted to be used by another person under any circumstances. A Gold Annual Pass is valid for 12 month, however this will be a rolling Direct Debit contract and you must give us 28 days notice before expiry to cancel. Please note you cannot cancel your annual pass mid contract, once the direct debit is rolled over you will contracted to the next 12 months. Gold Annual Passes are not refundable, either in total or in part under any circumstances. Gold Annual pass holders will also benefit from 20% off all purchases, 2 night Crealy Meadows camping stay, 30% off entry for all family and friends & 30% off camping and glamping breaks. Your two night Crealy meadows stay is on selected dates only & subject to availability. This will not be valid in the Devon school holidays. 30% off entry for friends is only valid if the Annual Pass holder is present & the pass is valid. 30% off for friends cannot be used in conjunction with any other offer. This discount can only be used when present at the Theme Park & not online. One ticket can be purchased at 30% off per Annual pass and can only be used once within 24 hours. (Please note this is not valid on Crealy Christmas Spectacular tickets). 20% off all purchases is only valid at selected outlets please check before purchasing. Not to be used in conjunction with any other offer. 30% off Crealy Meadows discount is subject to availability and only valid on Camping & Glamping breaks at selected times of the year *Not to be used in conjunction with any other offer. Gold annual pass holders can upgrade to Platinum passes at the Theme Park or over the phone. The additional cost in the annual pass will be added to your monthly direct debit payments. This can be upgraded at any time. A Silver Annual Pass permits the person named on it to gain entry into the Theme Park during any off peak weekdays & peak and off peak weekends. A Silver Annual Pass can only be purchased on Direct Debit & a £30 per person deposit will be taken, this will come off the total cost of the Annual Pass. Silver Annual Pass holders will only be permitted into the Park on production of their valid Annual Pass card. Lost or stolen Silver Annual Passes can only be replaced after a security check for a fee of £3.00 per Annual Pass . This fee is non-negotiable. A Silver Annual Pass is issued individually to each person and cannot be used by another person. It is not permitted to be used by another person under any circumstances. A Silver Annual Pass is valid for 12 month, however this will be a rolling Direct Debit contract and you must give us 28 days’ notice before expiry to cancel. Please note you cannot cancel your annual pass mid contract, once the direct debit is rolled over you will contracted to the next 12 months. We will request any cancellations in writing; this can be done via letter or email. Silver Annual Passes are not refundable, either in total or in part under any circumstances. Silver Annual pass holders will also benefit from 15% off all purchases & 25 % off entry for friends. 25% off entry for friends is only valid if the Annual Pass holder is present & the pass is valid. 25% off for friends cannot be used in conjunction with any other offer. This discount can only be used when present at the Theme Park & not online. One ticket can be purchased at 25% off per Annual pass and can only be used once within 24 hours. (Please note this is not valid on Crealy Christmas Spectacular tickets). 15% off all purchases is only valid at selected outlets please check before purchasing. Not to be used in conjunction with any other offer. Silver annual pass holders can upgrade to either a gold or platinum passes at the Theme Park or over the phone. The additional cost in the annual pass will be added to your monthly direct debit payments. This can be upgraded at any time. A bronze Annual Pass permits the person named on it to gain entry into the Theme Park during any off peak days. A Bronze Annual Pass can only be purchased in full and is not available on Direct Debit. Bronze Annual Pass holders will only be permitted into the Park on production of their valid Annual Pass. Lost or stolen Bronze Annual Passes can only be replaced after a security check for a fee of £3 per Annual Pass. This fee is non-negotiable. A Bronze Annual Pass is issued individually to each person and cannot be used by another person. It is not permitted to be used by another person under any circumstances. A Bronze Annual Pass is valid for 12 months from purchase, after this time, It must be renewed, To keep the price for life, Bronze Annual Pass holders must renew before the expiry date. Bronze Annual Pass cards are for entry only and do not receive any other additional benefits. Bronze Annual Pass Holders do not receive discounted Crealy Christmas Spectacular tickets. Bronze annual pass holders cannot upgrade to another annual pass until their 12 months pass has expired. By renewing on or before the expiry date of the Annual Pass, the individual Annual Pass renewal price will remain the same. All Annual Pass holders please note that this offer will cease with immediate effect if you allow your individual Annual Pass to expire or if, at any time, a Direct Debit instruction is cancelled or a payment is referred due to lack of funds. Please note that the price for life is only valid on Silver, Gold & Platinum Annual Passes. A Mini Annual Pass permits the person named on it to gain entry into the Theme Park alongside a full paying adult or either a bronze, silver, gold, platinum Annual Pass holder. A Mini Annual Pass can only be purchased in full and is not available on Direct Debit. Mini Annual Pass holders will only be permitted into the Park on production of their valid Annual Pass card. Lost or stolen Mini Annual Passes can only be replaced after a security check for a fee of £3 per Annual Pass. This fee is non-negotiable. A Mini Annual Pass is issued individually to each person and cannot be used by another person. It is not permitted to be used by another person under any circumstances. A Mini Annual Pass is valid for 12 months from purchase, after this time, if the child is over 1 metre tall, they must purchase one of the following: bronze, silver, gold or platinum Annual Passes. Mini Annual Passes are not refundable, either in total or in part under any circumstances. Mini Annual Pass cards are for entry only and do not receive any other additional benefits. Crealy Theme Park & Resort reserve the right to vary these terms and conditions at any time. Any ticket purchased through Crealy Theme Park & Resort such as at admission gate, online or through the call centre will be able to upgrade to a Crealy Annual Pass. The cost that will be deducted off the Crealy Annual Pass will be the amount that you purchased your ticket for. As an example if you purchased a ticket for £21.95 it will be taken off of your Crealy Annual Pass. This is available on full paying Annual Pass and direct debit Annual Passes. A Senior Annual Pass permits the person named on it to gain entry into the Theme Park during selected opening times. A Senior Annual Pass is valid for age 65+ only. Senior Annual Pass holders will only be permitted into the Park on production of their valid Annual Pass card. Lost or stolen Senior Annual Passes can only be replaced after a security check for a fee of £3 per Annual Pass. This fee is non-negotiable. A Senior Annual Pass is issued individually to each person and cannot be used by another person. It is not permitted to be used by another person under any circumstances. A Senior Annual Pass is valid for 12 months from purchase. Senior Annual Passes are not refundable, either in total or in part under any circumstances. Senior Annual Pass cards are for entry & 15% discount on park purchases only and do not receive any other additional benefits. Any ticket purchased through Crealy Theme Park & Resort such as at admission gate, online or through the call centre will be able to upgrade to a Crealy Annual Pass. The cost that will be deducted off the Crealy Annual Pass will be the amount that you purchased your ticket for. As an example if you purchased a ticket for £21.95 it will be taken off of your Crealy Annual Pass. This is available on full paying Annual Passes and direct debit Annual Passes..
All Direct Debit Annual Pass holders are subject to an annual (12 month) agreement, paid by 12 monthly instalments and that this agreement is not cancellable during that period. You will be agreeing to collections being made from the account details supplied on the 5th of each month, and that no other alternative processing days will be offered. Should you fail to make a Direct Debit instalment on the 5th of the month that Crealy will attempt to take payment on two subsequent attempts within 21 days. If these all fail or if the Direct Debit instruction is cancelled for whatever reason within the 12-month period then you will not be offered the opportunity to continue as a Direct Debit Annual Pass holder. All Annual Pass holders attached to the said bank account will immediately forfeit their annual pass benefits including, access into the Park and all pass holders discount schemes. The full outstanding balance, including any missed instalments, for the unexpired 12-month period will become immediately due for payment. It is the Annual Pass holders responsibility to keep Crealy Theme Park & Resort informed of any change to their contact or bank account details. No refunds will be made by Crealy Theme Park & Resort in result of the Annual Pass Holder not doing so. If you have purchased your Annual Pass online or over the phone you can contact us within 14 days of entering into this contract to cancel, please contact 01395233200 or email Fun@crealy.co.uk within 14 days of purchase. You will be entitled to a refund of any monies paid in the 14 day period less a deduction for the full gate price for any days that you have entered the Park using your card, this could result in an extra charge being made to you. Direct Debit Annual Passess are non-transferable and non-refundable. Direct Debit Annual Passes cannot be changed to full paying Annual Passes.